What do you think, when businesses such as airlines and hotels are affiliating themselves with certain religions? 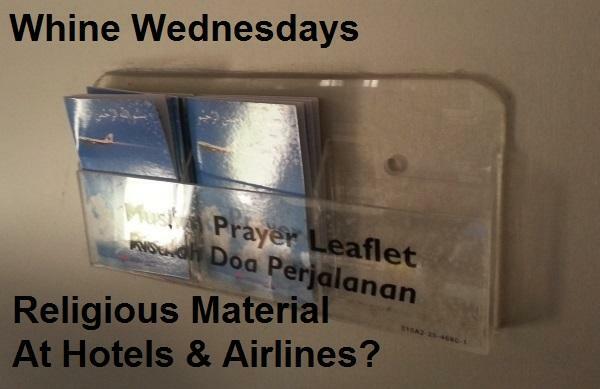 Yesterday, when I took Malaysia Airlines from Jakarta to Kuala Lumpur, I again saw these prayer leaflets that are out there for anybody to grab. The Marriott’s association with the Mormon faith is well known and you can normally find the Mormon bible and new testament on a drawer next to the bed. Alaska Airlines was “ridiculed” for distributing prayer cards with meals and drinks for their first class passengers, but this was ended last year. Personally, I am against for a business to distribute these kind of material. I don’t mind if it would be request only. But having certain religious material while leaving all the others out, is neither the best nor the right choice. If a business decides to have Christian or Muslim material out in he display, they should include all the other religious sects as well. Marriott Bonvoy Launch Events At Hotels – Report Your Experiences! Hilton Honors Waldorf Astoria Maldives Ithaafushi Award Pricing Anomaly? Where’s the Marriott Bonvoy App?